The world is facing environmental issues of a magnitude we have never seen before. 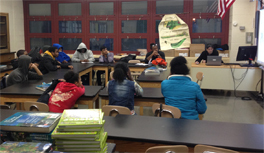 Our AP science students are tackling this head-on due to the efforts of one of our outstanding science teachers. Carol Wang is a proud recipient of the 2018 Project Kindle Fellowship from Earthwatch. This past July, she was fortunate enough to have the opportunity to go to Little Cayman with 7 other NYC Public School teachers to study endangered corals. It was certainly an amazing experience and one that she appreciates deeply and will never forget–one that she would like to share with students. So as part of the Earthwatch mission, as well as our own MVBHS mission, she plans to take students with her to Catalina Islands to engage students in actual hands-on, scientific field research with established scientists in the field in conduction with the Wrigley Institute of the University of Southern California. Her ambition is to create an opportunity of a lifetime for her students. Not only to inspire them to be an advocate for a sustainable environment, but also to pursue studies in the STEM field and to teach them life skills. Carol's enthusiasm and determination to make this adventure a reality has permeated the students who have been selected for this very special project. Since the summer they have been working hard to raise the funds for this trip. The good news they have generated most of the money, but that still leaves them short of the goal and time is running out. We are therefore asking for your help. Any donation you make will help pay for this unique learning experience and possible kindle a life long interest in the sciences. Please help bring this experience to a group of incredible students who have the potential to change the world for the better if given the opportunity. For every donation of $100 we will send you a specially designed, one of a kind, T-Shirt created by our team of budding scientists. Help send these kids on the science trip of a lifetime! The MVBAA has recently created a partnership with several non-profit organizations to create a series of innovative programs to help revive MVB. It is our belief that with these entities we have the necessary skills, experience, and resources to help reverse the decline of the school. We are excited to have them. Below we have a brief description of the proven programs now in place at the school. For more information on any of the programs, please use the links provided. Summer Search: Summer Search is a national youth development and college success organization which helps students from low-income households develop the skills and character traits they need to become college educated leaders who give back to their families and communities. 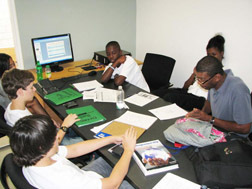 Summer Search focuses on teachable skills – often called ‘non-cognitive’ or soft-skills like problem solving, resiliency, accountability and grit – by providing a combination of year-round mentorship, life-changing experiences, comprehensive college and financial aid counseling, and a consistent network of support through college and beyond. NFTE: Network for Teaching Entrepreneurship. 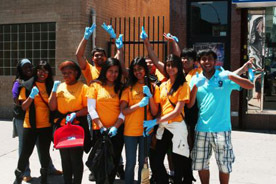 This program inspires young people to stay in school, recognize business opportunities, and plan for successful futures. They expose high school students to entrepreneurship, economic systems, practical skills, and provide real-life experience. It includes extensive teacher training and engages professional volunteers to work with the students. TAP: The Animation Project. This program uses digital art technology to nurture the social, emotional, and cognitive growth of youth. It is a workforce development tool, which builds interpersonal skills, promotes collaboration ,and develops healthy self-esteem. LETS GET READY: This organization offers SAT Prep Courses and a whole lot more. In addition to their core program, workshops and support services focusing on topics including career exploration, completion of financial aid forms, application essays, and successful transitions to college life are offered throughout the year. Co-sponsoring MVB Robotics Team: One of the largest robotics teams in the city, with over 30 students. We compete each year in the FIRST Robotics competition. Our students learn hardware design, software programming, and motion management skills and techniques. It is the centerpiece of the pre-engineering program. All of these programs are designed to enrich the academic experience for the students at MVB and form the cornerstone of our efforts.